Limited *August Dates* now available. Special Spring rates. Book today! 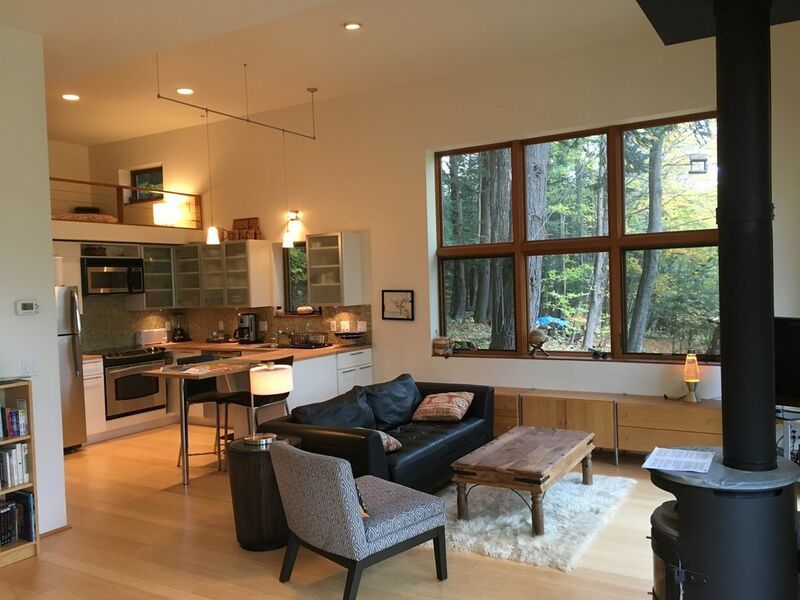 This ingeniously designed, recently renovated home, features all the extras to enjoy your Leelanau experience. Nestled on *10 private wooded acres with views to Sugar Loaf Mountain, surrounded by conservation easement and national lakeshore lands. Only minutes from access to multiple all sports lakes, golf, dining and live music, Leelanau Conservancy hiking trails, the Sleeping Bear Heritage Trail and Sleeping Bear Dunes Natl Lakeshore beach and trail access, *10 miles from Leland "Fishtown" or Glen Arbor "Most Beautiful Place in America", 18 miles from Traverse City "Cherry Festival and TC Film Fest" Equally suitable as a couples' retreat or family vacation base of operations. Enjoy a wine/microbrew/distillery/hard cider tour, take in the fall colors, search for the perfect Petoskey stone, Morel mushrooms, wild flowers and leeks. Breathtakingly beautiful winter getaway as well. Ideal for the outdoor enthusiast who also enjoys modern conveniences. The house officially has two bedrooms but also includes a spacious, cleverly designed sleeping loft for two above the open floor plan of the main level. The master bedroom with king size bed has a private second story deck with view to Sugar Loaf peak, an additional full size futon is available in this room to accommodate two additional guests. The 2nd bedroom with full size bed sleeps two and the living room couch easily converts into a single bed. The main floor full bath features a jaccuzi tub, while the 2nd floor bath offers a roomy tiled shower. Washer and Dryer, for your convenience, located on 2nd floor off the bath. Enjoy the open, modern floor plan of the main level. The kitchen includes full sized refrigerator, glass cooktop stove with microwave above, oven below(gas grill on main outdoor deck) All the items you'll need to prepare and enjoy a meal are provided, even a dishwasher for clean up after. Multiple dining configurations are available with countertop seating or full dining room(or umbrella table outside) Cozy up in front of a fire in the RAIS of Denmark wood stove, pull a book off the shelf from one of three library areas, do a puzzle or play a game from the entertainment cabinet(children's books and games included) Or simply enjoy the views from the surrounding picture windows. Bamboo, tile and wool berber at your feet, spacious closets, and warm ample lighting finish off the experience. The grounds include thoughtful landscaping, two decks with outdoor seating and gas grill, fieldstone patio with Japanese fish pond, wildlife and bird viewing areas, campfire ring and patio wood fire grill, nearby hiking/snowshoeing/XCountry ski trails. Ample parking with room for your trailered boat, kayaks or bikes. Your hosts Tricia and Shawn Denton built their own home on the adjacent 10 acres in 2001 and are available to assist you in maximizing your time at their "Leelanau Getaway"
Spend your time HERE, enjoying this "Leelanau:Land of Delight"
20+ year residents of the area with extensive background in hospitality, recreation, nature and the outdoors. Private! Beautiful property and home, stocked with everything you could need. And conveniently located to everything you’ll want to see and do in and around Sleeping Bear Dunes and Leelanau! Large capacity portable unit (installed summer only) on upper level of house in Master Bedroom. Onsight for up to 5 vehicles plus boat or other trailer. Overflow parking available on adjacent property. Snowshoes available upon request. Cross country trails within 2-6 miles of the house in Sleeping Bear Dunes, 10 minutes to The Homestead, 45 minutes to Crystal Mountain Spa and Resort for downhill. This cabin was perfect for my family spring vacation. The cabin was equipped with everything, even fresh cut fire wood. The views from every window were beautiful in every room. Location to the dunes and M22 was ideal for exploring the lakeshore. The cabin was absolutely idyllic and dreamy! Definitely one of the best weekends of our lives! Very lovely property with central Leelanau location! Host is very helpful. Tricia was very accessible and made an effort to make my stay pleasant and peaceful. Thank you! Five stars! Beautiful home. Host is welcoming and accommodating. We had a wonderful ski weekend. We are looking forward to returning for a summer visit. Home is spacious for everyone with a large dining table for meals and card games. The house was even better in person! The owner was so accommodating and did an excellent job of anticipating our needs prior to arrival! Will definitely be back!